The first spring flowers will be greeting the eye any day now out west. There will be chionodoxas, snowdrops, scillas, narcissus, hyacinths, tulips and other spring flowers. Snow has receded leaving a reservoir of moisture in the ground. All at once there are so many things to do. Dead grass and fallen leaves should be removed from the lawn as soon as the ground can be walked on without damage. An early feeding with a nitrogen fertilizer is needed to stimulate new growth. Lawn fungus diseases like snow mold should be controlled by application of lawn fungicide. Garden soil preparation can begin for vegetable and flower seed beds. Heavy clay soils dug in the fall need only to have the lumps raked down. Do not walk on or work a heavy soil, however, until it has dried out somewhat. Otherwise, hard clods may form that will last throughout the season. Lighter, sandier soils can be tilled in spring just before planting. Organic matter – like peat, humus, compost or manure can be incorporated into the soil when it is tilled. Such organic matter improves both heavy and light soils. Organic matter improves the soil’s ability to hold moisture, helps reduce compaction, and thus allows water to penetrate better. Roots grow better where soil is open and porous. Organic matter also improves soil fertility, particularly the nitrogen level. In most cases, though, phosphorus needs to be added from other sources. Soil tests for nitrogen, phosphorus and potassium needs are helpful. Most soils in the west need nitrogen and phosphorus at least. Both of these can be provided by an ammonium phosphate fertilizer. If the nitrogen level is already high because of the use of organic matter, phosphate fertilizer alone may be all that is needed. If nitrogen, phosphorus and potassium are all required, then one of the many complete fertilizers on the market can be used. Generally, after soil tests are conducted, one is told how much fertilizer to use in a given plot. Often the fertilizer packages give some idea of rates to use. Follow recommendations carefully and do not over-fertilize. If you are not sure about what fertilizers to use, or how much, ask your county agent. Fertilizer spreaders can be use to apply nutrients in various ways. They can be broadcast over the soil just before the garden is plowed. This works well when phosphorus is the main element in the fertilizer, and where perennial plants arc to be grown. For annual vegetables and flowers the fertilizer can be placed in rows on each side of the seed row, about two to three inches away. Fertilizer can be placed in rings about two to three inches away from new transplants or can be mixed in a weak solution in the water used on each plant as it is set out. A few vegetables that benefit from early planting are: onions, radishes, peas, lettuce, spinach and beets. A few of these which grow fast can be sown repeatedly during the season. It will soon be time to remove mulches from perennial plantings. Don’t be too hasty. Wait until plants show a little growth through the mulch. 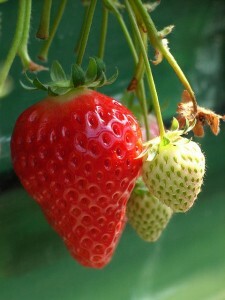 In the case of strawberries, leave some mulch between plants so the fruits develop on the straw litter, rather than on the ground.